Treats localized adiposity and retention of fuids. 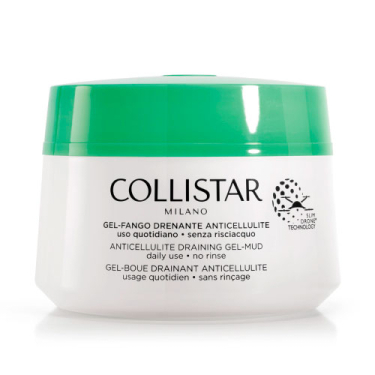 DESCRIPTION: Anticellulite Draining Gel-Mud from Collistar is a daily treatment to treat localized adiposity, retention of fluids and cellulite. It combines the benefits of traditional mud with the outstanding effectiveness of Slim Drone Technology, a penetration system that, like a drone, encapsulates and releases a powerful lipolytic active ingredient, Coccoloba Uvifera (Beach Grape) extract, directly onto the target: adipose cells. The unique gel-mud texture surrounds the body in an invisible remodeling wrapping, making it immediately softer and firmer, also enhancing the product's sensory effect upon application. Gently massage the gel-mud into the skin in upward movements; Attack strategy - apply twice a day for 15 to 20 days; Prevention and maintenance - once a day.